In honor of this year’s International Holocaust Remembrance Day on January 27, two shows that give viewers a heart-wrenching look at worlds the Nazis destroyed are now available for streaming. The first, Indecent, is a play about an infamous Yiddish play from the early 20th century. Sholem Asch’s God of Vengeance is the story about a Jewish brothel owner who commissions a Torah scroll in order to present a veneer of piety and his young daughter who falls in love with one of the prostitutes working for him. Despite opposition to God of Vengeance and questions about its depiction of Jews, the play was a hit in Europe. In 1923, God of Vengeance came to New York City during a time of anti-immigrant frenzy that was in part aimed at Jews. It was the first production on Broadway to stage a lesbian kiss, and the show was charged with obscenity, shut down and the cast and director put on trial. 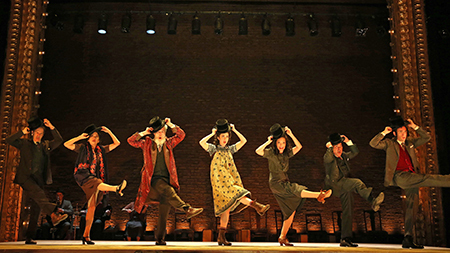 Written by Pulitzer Prize-winner Paula Vogel and directed by Tony Award-winner Rebecca Taichman, Indecent, available through BroadwayHD, is a play within a play that opens with the ghosts of actors wearing yellow stars on their chests and remembering the creation and production of God of Vengeance. Indecent follows a troupe of actors who risk lives and careers performing the work at a time when art, freedom and truth were on trial. The second show is a new documentary called The Number on Great-Grandpa’s Arm, premiering on HBO on January 27 and thereafter available on HBO’s streaming services. The short film is narrated by 10-year old Elliott, who relates the story of his beloved great-grandfather Jack’s life in Poland before and after the war. As a teenager, Jack was forced into a ghetto with his family, taken to a work camp and then to Auschwitz before being liberated by the Russians during a forced march. Elliott asks his great-grandfather about his family and his childhood before and after the Nazi takeover of Poland. The questions flesh out details about Jack’s life, from the reason for his love of hats (a cap with money sewed into the brim saved his life in the camps) to his charity to the hungry and poor who come to the fish shop he owns. The loving interaction between Elliott and Jack is one of the highlights of the film, directed by and produced by Amy Schatz, part of an education program from New York City’s Museum of Jewish Heritage. Balancing live action and evocative watercolor animation from artist Jeff Scher, the documentary’s deceptively straightforward narrative and question-and-answer format present a poignant Holocaust storyline that is accessible and appropriate for children.